Long time no blog! Most of my recent Internet activity has been via social networks, especially Facebook (@Shawn.Kimbro), Twitter (@ShawnKimbro) and Instagram (@Shawn_Kimbro). It’s very easy to get a message out via these outlets and I can very quickly post fishing pictures and short reports. If you haven’t already, please look me up. I also have some new Chesapeake Bay How-To fishing videos coming out soon on YouTube, so be sure and follow me there as well. 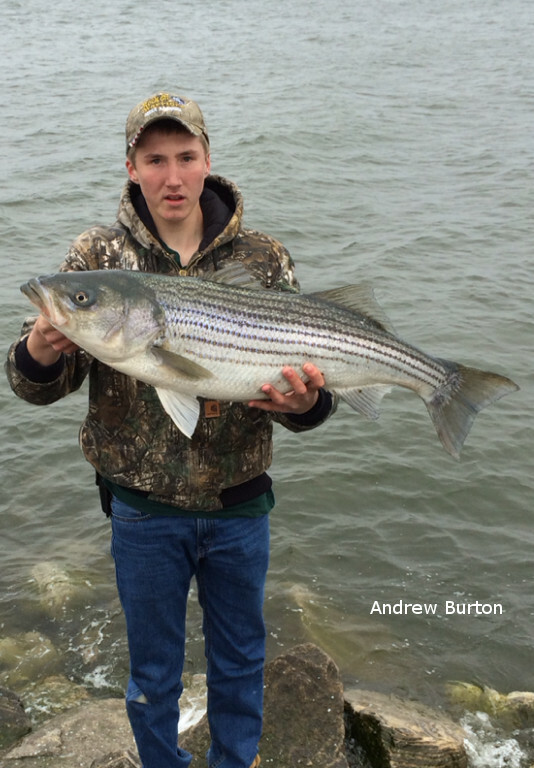 This weekend marks the opening of the striped bass kill season in Maryland. 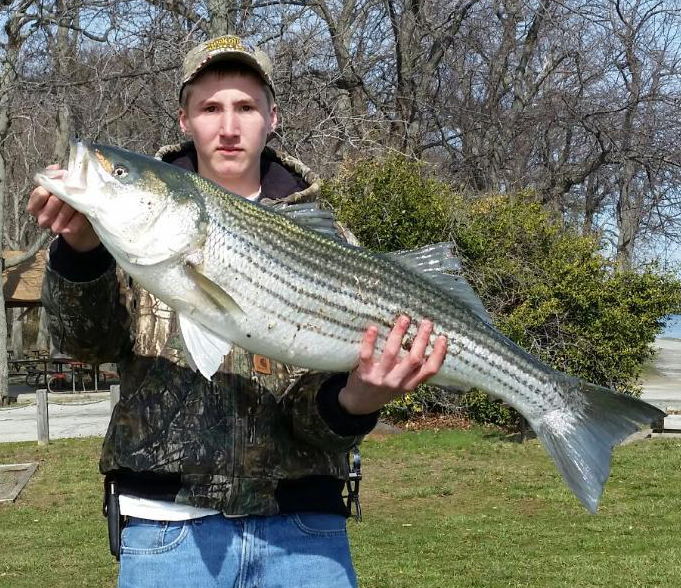 On April 18th it becomes legal to catch and keep a striped bass. So far in 2015, we’ve been releasing all the fish we catch. The regulations are different this year than they’ve been in years past. Between April 18 and May 15, anglers can keep one rockfish per day if it measures (a) between 28 and 36 inches in length or (b) over 40 inches. After May 15, you can keep two fish, but there is a minimum size of 20 inches and only one of those fish can be over 28 inches. Hopefully, Maryland anglers have heard of these new regulations by now, but it never hurts to spread the word! Let’s also spread the word that it’s a good idea to release those 40-inch-plus fish too, even though it’s legal to keep them. Almost all the fish caught in the next couple of weeks will be pre-spawn. If we want strong rockfish populations in the future, we have to let the big spawners go. Most of the light-tackle fishermen I know don’t pay much attention to the opening of kill season. We’ve already had some of the most exciting fishing of the year. Kill season just means more boats on the water and more big fish taken before they have a chance to spawn. 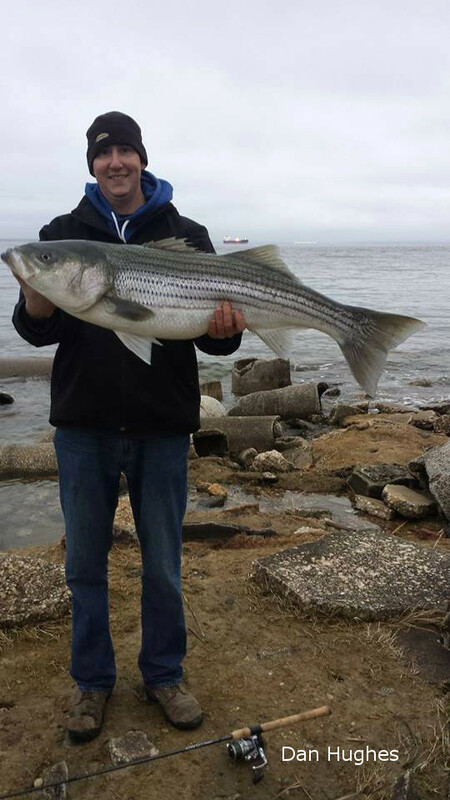 The spring rockfish migration is well underway now and fish are moving up the Maryland portion of the Chesapeake Bay in waves. So far fishing has been pretty good. My assessment of the 2015 warm-water-discharge season up to now is good but not great. Oh, we’ve released plenty of big fish – some well over fifty pounds – but I’ve seen a lot better cold-weather fishing. Some of the most exciting fishing in April and May takes place right along the bank. Lately, shore fishing is so good that some of my fishing buddies are leaving their boats at home and hiking down to the piers and points to cast. They’re catching trophies too. My friend Andrew Burton of Annapolis is catching and releasing big fish on quick outings before and after school. He’s had a few evenings when he’s landed three or more stripers that were over forty-inches long! Andrew isn’t alone. 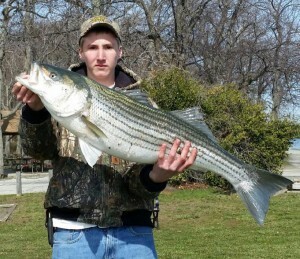 I’m hearing about big fish caught all along the western shore from Sandy Point State Park clear down to Point Lookout. On the opposite side of the Bay, my neighbor Dan Hughes has been wearing them out from the shorelines on Kent Island. The picture on the right is of a beautiful fish he released last week. There is also some nice fish being caught at the Matapeake Pier. Unfortunately, there’s also been some poaching at Matapeake. Maryland Natural Resource Police busted three fishermen earlier this week for keeping big rockfish they caught from the pier. Let’s hope these bad guys get the maximum sentence possible. In my younger days, almost all my striper fishing was from shore. 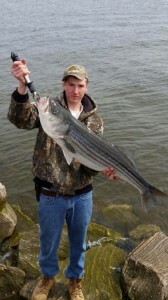 The first rockfish I ever caught was with a topwater plug casting from the bank. Here are some things I’ve learned along with a few tips from Andrew, Dan, and other anglers who are successfully catching big stripers from shore. 1. Rock Those Rocks – Well duh, that’s why they call ’em rockfish! Look for shorelines with rocky points and jetties. Better yet, look for submerged rock piles within casting distance from shore. There will be fish there! Also, don’t overlook the rocks along the bank. When you first get to your spot, stay very quiet, stand way back and cast along the shoreline. After you fished in close you can cast on out farther or even wade. 2. Fan Cast the Flats – Shallow flats near the mouths of creeks or rivers are great places to catch big fish in early spring. Pay attention to the tide cycles because the most productive times are when the warmer water is coming out of the rivers and sweeping across the flats. You don’t need structure in that situation because the fish will be foraging throughout the area looking for bait. Concentrate on flats that are at least three feet deep. Four or five is better. 3. Cast to the Current – Look for rips and areas where you can see the current moving. When you see consistent ripples on the water caused by current, it means there is either a drop off or an obstruction underneath. You can catch fish upstream or downstream of the rip, but your best chance is to cast right on top of it. Always keep in mind that a lure moving downstream with the current looks more natural than one running against it. 4. Bomb ’em with Blood Worms – I’m not much for bait fishing, but there’s no denying that rockfish love blood worms. Remember that stripers have a very keen sense of smell. So much so in fact that I dedicated an entire section to it in my book The Right Stuff – Gear & Attitudes for Trophy Light Tackle Fishing. I believe rockfish can smell blood worms from at least a quarter mile away. You can also catch fish with lures after they’re called in by the smell of blood worms. 5. Seize the Circle – Not only are circle hooks a great idea, they’re required by law in Maryland. Non-offset circle hooks are mandatory when using big hooks and natural bait. Use at least a 5/0 hook – 7/0 or 8/0 isn’t too big – and make sure you’re using true non-offset circles. It’s easy to get confused by mislabeling. If you aren’t sure, check out this article I wrote about circle hooks a while back. When you’re bottom fishing for stripers, use a Carolina rig or some other similar sliding-sinker arrangement so the fish is less likely to feel tension when it takes the bait. 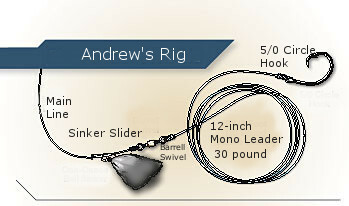 Here’s Andrew’s tried-and-proven method, a variation on a fish-finder rig: “I use a 12-inch leader of 30-pound-test mono and a sinker slider with a 3-ounce triangle weight. I cast it with an 8-foot surf rod with a Shimano Baitrunner 4000.” Since you’ll probably be fishing in areas where there are a lot of snags and obstructions, I recommend at least 20-pound-test braid for your main line. 6. Pitch Those Plastics – Don’t wanna use bait? Plastic swimbaits are great from shore. There are huge fish around, so show them a big bite by using a lure that is at least four-inches long. Incorporate all the strike triggers you know and appeal to the striper’s sense of sight and smell by hotrodding your plastic baits with color-contrasting and scented dye. I like swim shad with the weight built in, but you can also use unweighted bodies with jig heads. Swimbaits should be heavy enough to get near the bottom and bounce along occasionally, but not so heavy that they drag. Make sure you pick out a swimbait with a very soft tail so there is lots of action. 7. Sling Those Searchbaits – Hard plastic lures are also great for casting from shore. My favorite hard plastic lures are Daiwa Salt Pro Minnows and Yo Zuri Crystal Minnows, Mag Minnows, or Mag Darters. Almost any lure that is designed to be jerked along beneath the surface of the water will work. If the water is less than 4-feet deep, I prefer floating plugs. Otherwise, go with jerkbaits that suspend. If you aren’t getting hit, switch to a brightly-colored Rattletrap or rock it old school with a Kastmaster spoon or bucktail/pork rind combo. A little experimentation can pay off big time. Make sure you have strong hooks and mash the barbs on the trebles. 8. Try ’em on Top – My usual rule for topwater fishing is to wait until water temperatures reach 65 degrees, but now that the migration is in full swing and there are lots of hungry fish around, don’t be afraid to rush the surface season. Keep in mind that the water on the shallow flats will warm up fast on sunny days. Use big splashy chuggers with strong hooks like Stillwater Smackits or Lonely Angler Holos and don’t be afraid to tie on a teaser fly or even a small soft plastic bait as a teaser. Use a dropper loop and tie the teaser about a foot IN FRONT of the chugger. Try a Heddon Super Spook on calm days, especially right after sunrise or just before sunset. All the above techniques will work whether you’re fishing from a boat or the bank, but they’re especially good from the bank. The best places to fish from shore are usually right under your nose. Don’t be afraid to walk down below that bridge you drive across every day or cast off the pier at the boat ramp. My friend Brian Tsai who is a Naval Academy Midshipman has caught more rockfish casting from the Academy wall in the past few months than most fishermen will catch in years from a boat. The weather is getting better and the time is right for good catching. When it comes to shore fishing, there’s a lot more we could talk about including all the other species we can catch from the bank this time of year. Stay tuned for more about that! 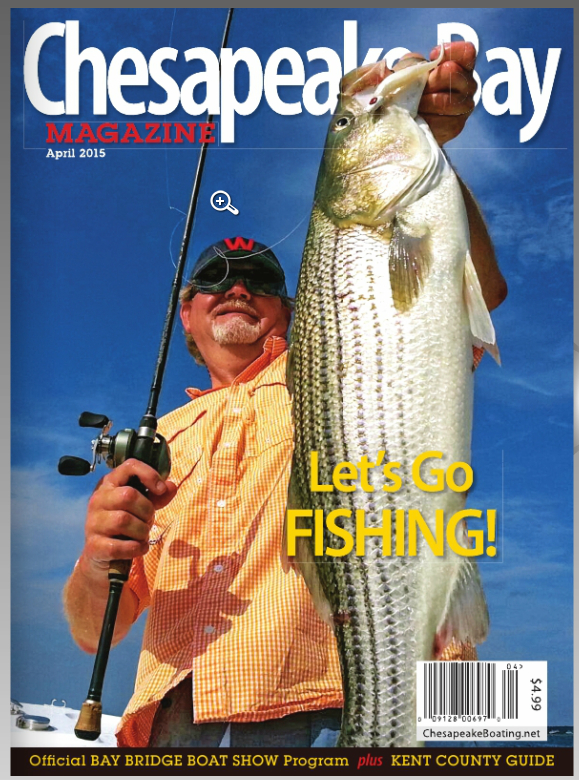 For more fishing info, check out the April edition of Chesapeake Bay Magazine. 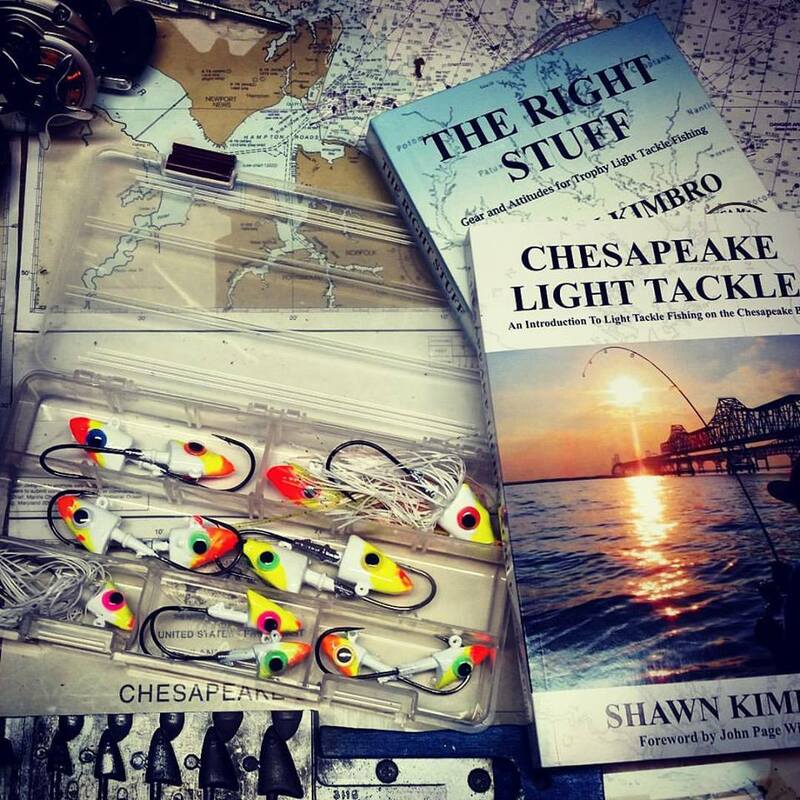 You’ll see a familiar face on the cover and inside you’ll find Admiral John Page Williams’ Fearless Fishing Forecast, a great introduction to Chesapeake Bay fly casting by Gary Reich, and lots of other fishy content. You can find it on the magazine racks of nearly any store in the area, download it at iTunes, or click on the picture below for a digital preview. Tight lines! I’ve been trying to catch “Bubba” (a 34+ pound rock) for decades at Liberty Reservoir and Severn River (off the half bridge). You have given me SO MUCH HELPFUL INFORMATION!! I feel so confident that once I buy new supplies as you recommended, Bubba will be coming home for dinner!! Thanks so much!! Go get Bubba my brother, but throw him back after you take picture,so I can catch him later also. CATCH AND RELEASE ALWAYS THE BEST ADVICE. HANDLE HOOK AND RELEASE WITH CARE AND BUBBA LIVES ON FOR OTHERS TO ENJOY! Great article, super informative — thank you for taking the time to put this together!